We are a community garden in the Ceiriog valley in NE Wales. We are always open to visits and involvement from new people and have regular volunteer days on Thursdays. 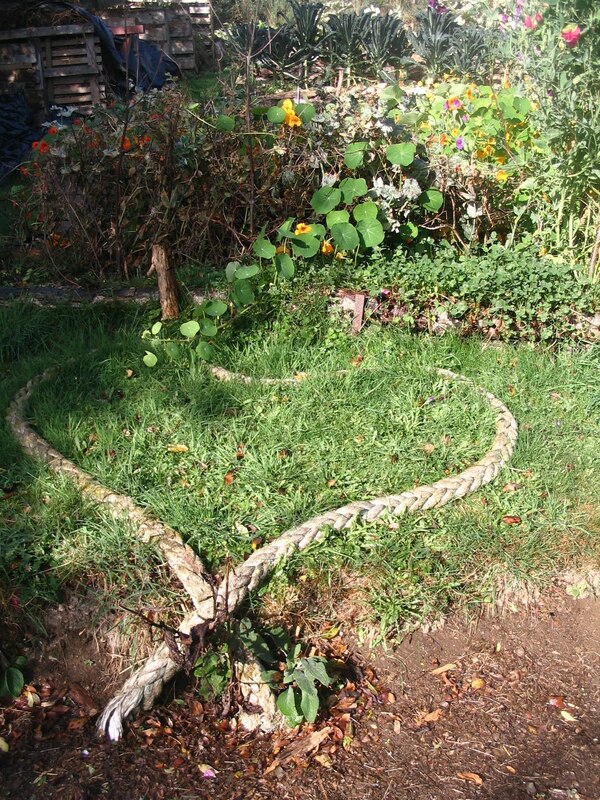 Garth Organic is a permaculture designed, community garden situated at 1000ft above sea level, just above the village of Glyn Ceiriog, near Llangollen. We share concerns over sustainability and climate change and work together to enhance both our local community and environment. See slides of the garden when first started and now. Our aims are to create a permaculture and organic educational resource to show people how easily they can grow food at home; to create a place for people to meet, learn from each other and share common values; to protect and enhance local bio-diversity; and to improve the well-being of all involved. We have been developing the garden since 2007 and with most of the work done by hand, the results are startling. On our gorse covered 2 acre plot we have created a series of terraces, forming a natural amphitheatre where members can perch on a camomile seat. The seat, carved out of the earth in our social area, is just one example of how the challenges of the site have been innovatively incorporated in to our designs – working with the parameters of the terrain rather than against. Higher up the hillside a rainwater harvester has been set up with capacity for 8,000 litres of water, which gravity waters the whole growing area of the site. Wood is coppiced on site and seasoned to feed our small stove used every Thursday for making refreshments. The types of activities volunteers get involved with include: composting, seed sowing and saving, creating habitats and monitoring flora and fauna, coppicing, harvesting and storing vegetables, tree planting and pruning, pest control i.e. slug traps and mulching. Recent developments include planning a forest garden, extension of wildflower meadows, a wattle and daub, oak shingled compost toilet and introduction of a colony of honey bees.